Rubber Conveyor Belts- Distributors of Pashupati Rub Tech PVT. LTD.
With a focus on the ever evolving demands of our customers, we are supplying a wide assortment of Rubber Conveyor Belts. These conveyor belts are manufactured under the supervision of these professionals and experts using high grade and premium quality raw material, which are sourced from authentic and reliable dealers who are well known names of the market. Finest quality rubber material which is used in the manufacturing process of these belts gives guarantees superiority, durability, and easy functioning. These products are the preferred choice of our clients because availability in different types. Rubber conveyor belts offered by us are generally used for transportation of coal, crushed ores, limestone, bauxite, sand and cements. Further, these belts are fabricated in accordance with industry’s laid norms and standards with using ultra modern machines and latest technology. 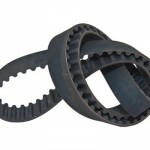 Our manufactured array of Rubber Conveyor Belt are widely appreciated by our clients due to their most significant features such as excellent elasticity, longer service life, corrosion resistant, high tensile strength, unique carcass construction, high tensile strength with low weight, durability, highly efficient and improved resistance to mechanical damage. These belt conveyors are enthusiastically balanced for clean rotation and ensured efficiency in the process. These belts consist of one or more layers of rubber material. An under layer of material to provide linear strength and shape called a carcass and an over layer called the cover. Additionally, these belts are designed and manufactured under the stern observation of our adroit professionals and these are available at our production unit in various sizes and customized as per the specifications of our prestigious clients given by them. Moreover, the products supplied by us can be obtained by our respected customer at industry leading prices.